Three Travels, by Murray Edmond, illustrated by Johanna Forsberg (Holloway Press, Auckland), 40 pp. 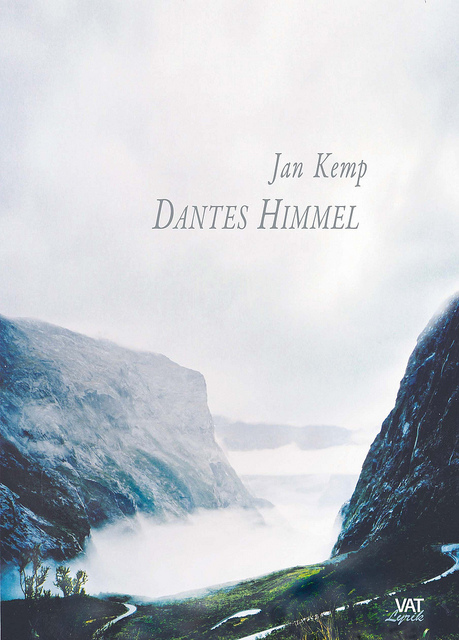 $150; Dantes Himmel: Gedichte aus Neuseeland, by Jan Kemp, translated into German by Dieter Riemenschneider, (Verlag André Thiele: Mainz am Rhein, 2012), 131 pp., $30. These two volumes won’t take up much shelf space, nor will they find a huge market in Aotearoa. The first is a small and very pricey edition; the second will mostly sell its print-run in the German-speaking world . Let me start with the tiny publication by Murray Edmond, Three Travels, a prettily-produced book of 40 pages with beautiful illustrations by Joanna Forsberg in an edition of 75 from the Holloway Press with Tara McLeod reponsible for the consummate printer-job. Three people involved, and this appears to be this group’s third collaborative effort; but I can’t afford the other two — they are obviously aiming for a collector’s market which is somewhat out of my reach. I’ll get back to this later, as there is something about this that perturbs me. I have to say, the ‘nag head’on the cover is terrifically amusing. I had an initial moment of puzzlement trying to work out what would happened if I took the second word in the title ‘Three Travels’ to be a verb, which would tumble us into Jerome K. Jerome country. There is a verbal whimsy implicit here (also implied by the cover image) which would not be a thousand miles away from those merry Edwardian boulevardiers. Joanna Forsberg is Polish (and not the rather sullen Saskatchewan ice-hockey girl Facebook trawled up), so I assume their trip to Poland and to Murray Edmond’s ancestral Scotland was a twosome; however the three symbolism comes up again in the use Edmond makes of the (unrhymed) ‘triplet’ poetic form: a pithy three-liner, often based on glimpsed texts seen on signboards or streetsides on their trip, and ironically thrown back at us, sometimes juxtaposed with others. This is something photographers do too, and I am vaguely reminded of philosopher Jean Baudrillard’s semantic snaps in the USA 30 years ago (see his 1986 book America), as well as of Harvey Benge’s clever snapshots. her blue jacket on the snow . However, qualms compell me to mention that there is a distribution problem, a ‘vulgarisation-of-the-aesthetic’ consideration here, which begs (the right word) a pretty thorny question: seventy-five wee books run off on the Holloway Press, with nice typeface and good paper; OK, but who is it for? Did Edmond and Forsberg give it to their intimate circle for Christmas, and are they going to bleed the dwindling budgets of libraries with the steep price tag? Alan Brunton, Sam Hunt, Ian Wedde, David Mitchell, Russell Haley — the poets of my (and Murray’s) generation — used to want their work out there; and so rough, smudgy, little volumes appeared, ending up as often as not in the remainder bins of Paul’s Bookshop or the UBS, from whence we gather a couple of bucks worth of poems to read and have kicking around the house in sheaves, gathering a few winestains on the way. Half a century earlier, French poets of the calibre of Mallarmé or Prévert would publish a de luxe edition of a couple of hundred for bibliophiles at a big price, on vellum in a binding of the collector’s choice, but simultaneously run a thousand copies off the same matrix on raggy paper for the public at the price of a packet of Gaulois or of a bottle of rough wine. Why this sudden leap into the exclusive world of a dollared élite? Not an unreasonable question — or is it? Jan Riemenschneider-Kemp’s latest offering, although not primarily for the New Zealand market, is a multi-media edition that runs to 1000 copies at the price of a pretty good bottle of wine. Ever an advocate for the spreading of poetry, the New Zealand-born bard formerly known as Jan Kemp has expanded herself with a very impressive German name. Her partner Professor Dieter Riemenschneider here serves as in-house translator. As a follow-up to their anthology of selected New Zealand poems translated into German, which I previously reviewed for Landfall Review Online, she has now brought out Dantes Himmel, a lovely little production of some 40 works as parallel English-German texts, with selection on a CD as well. Riemenschneider-Kemp is everywhere. Her self-imposed exile from New Zealand and long-time residence in Germany has in no way weakened her sensibility to New Zealand and its topography, vegetation and fauna. If her work is perhaps not overly concerned with the contemporary human inhabitants of Aotearoa, she does pays tribute to many dead poets from the New Zealand poetry canon. At least in part, her poetry is strongly concerned with her poetic self or its persona, in a manner reminiscent of the Romantic Keat’s ‘egotistical sublime’. visibly separating the two doesn’t exist. to prove it just for one moment before you go ? For me, these long cumbersome words and capitalisations are like tired grated carrots and limp lettuce in a cafeteria salad. But one would assume most German readers would read the poems in English and use Dieter’s versions as a kind of backup. Again, bi-lingual speakers will be aware of the difficulties of translation, or rather ‘Nachdichtung’: re-versification. There is no German verb for ‘partying’, which Riemenschneider has to render as ‘at a party’, while the expression ‘ripped bodices’ is also untranslatable directly. ‘Caravansari’, though, poses another kind of problem, as it is actually a staging-post or inn for caravans, a built structure, and I struggle to visualise the solemn steers as a meeting place of caravans deep in the Sahara. We can see where she is heading with this: a backlit cluster of beasts on the pristine skyline, but for my money it is not the exact word — still, perhaps others may allow an extension of poetic licence. . . Cannot beat or break without the Bang & Olufsen of your heart. Here, translator Reimenschneider actually doubles the wonderful ‘Bang’ (in German the word would denote anxiety) by adding a hammering ‘Hämmern’. Slight overkill perhaps? ‘Bang’, as in bang (this may sound a tad tautological) would also be recognised by any German reader as an onomatopoeic ‘bang’. For those of us (like this reviewer) who welcome the chance to hear Jan reading, the selection of poems on the CD are recorded in her distinctive lilt, and rendered into German as well. MAX OETTLI is a photographer, writer and critic who grew up in Hamilton, was educated at the Universities of Auckland and Geneva, and currently lives in Geneva, Switzerland. He returns to New Zealand regularly.